GBWhatsapp v6.70 Latest version is has been released with new themes, improvements, and minor bug fixes. GBWhatsapp Apk also comes with new features which include; ability to arrange the display of messages by oldest, Install 30 conversations instead of 25 and Add new Labels. This is GBWhatsapp Latest version 6.70 for Android February 2019. There are so many bug fixes and new themes to choose from, new options and fast in uploading messages. If you want to download the latest version now and you are scared of losing some messages, click HERE to learn how to prevent messages from deleting and now to recover it in case you lose them. 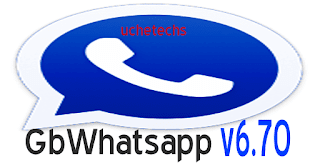 If you don't still know which one to download, check out GBWhatsapp Install Requirements from v6.65. Installing the App wouldn't be a problem, just update previous Apk to the latest version 6.70 and continue where you left off. That's all. You will be granted all new features.